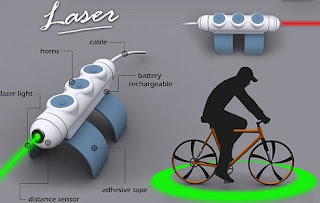 I saw this article on treehugger.com today about the "Laser," a device that shines a laser light in an elipse around your bike making you more visible. It also has sensors that respond to objects crossing the laser beams. If a car, for example, enters the elipse, the laser light turns from green to red, and the the devise sounds a horn until the car leaves the space of the beams. While this doesn't seem like a bad system, I personally prefer the Light Lane concept product, which I've posted about before. It looks more classy and clearly says "bike here!" - at least visually. Other thoughts about the two products? Has anyone seen similar systems on the market or in development? I like the fact that the Laser changes colors and alerts you when a car enters your space! But I doubt that will make the car move.